Pro-gov’t journalist calls for killing of Turkish businessman and individuals like him who he accused of being top Gulenists. Pro-government Turkish journalist Emre Erciş has called on Turkey’s intelligence agency to abduct or exterminate critical businessman Akın İpek and other top Gulenists following a court verdict in the UK that rejected Ankara’s request for his extradition. 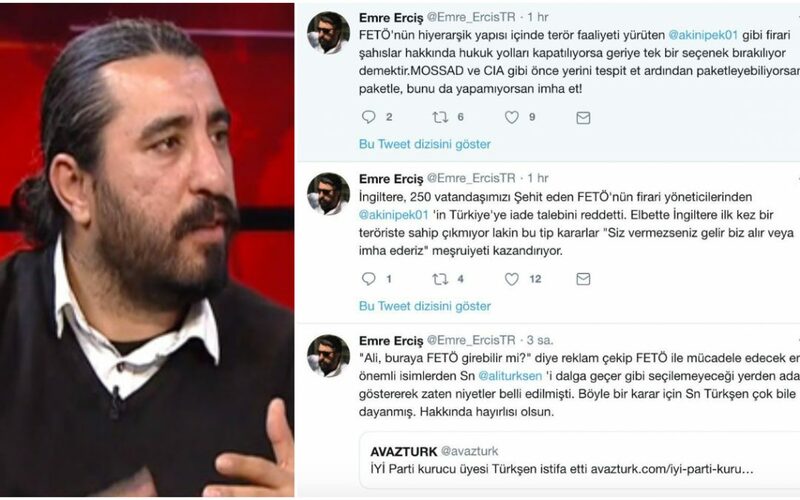 Posting a series of tweets shortly after the ruling, the Turkish journalist said that if the rule of law closes off all other avenues, there is only one way left to bring back to Turkey Ipen and other fugitive people in FETO’s hierarchical structure who are involved in terrorist activities. Twitter deleted the journalist’s tweets following complaints, Ercis later said. Turkish government accuses Gulen movement of masterminding the July 15, 2016 failed coup attempt and calls it FETO, short for alleged Fethullahist Terrorist Organization. The movement denies involvement and any terror activities. More than 220,000 people have been detained and 90,000 were remanded in prison over Gulen links in Turkey since the summer of 2016. Meanwhile, President Recep Tayyip Erdogan called on foreign governments to punish Gulenists in their own countries. In March, this year, Turkey’s National Intelligence Organization (MIT) abducted six Turkish nationals, one doctor and five educators, working for a group of schools affiliated with the Gülen movement in Kosovo and removed them to Turkey the same day. The abduction of the Turkish nationals sparked a political crisis in Kosovo and Prime Minister Ramush Haradinaj dismissed the interior minister along with the secret service chief. Kenneth Roth, executive director of Human Rights Watch (HRW) lamented the operation saying that the abductees would face the risk of torture and abuse in Turkey. Turkey’s Presidential Spokesperson İbrahim Kalın said during a press conference in September that the Turkish government will continue its global manhunt against the followers of the Gulen movement stating that the operation could take place in the US as well. Journalists as well as some Kurdish politicians are also reportedly at MIT’s target. This article originally appeared in Turkish Minute on Nov 28.